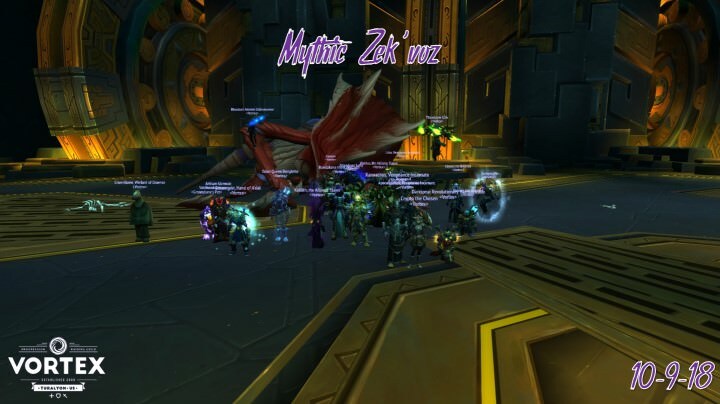 Vortex spent the last week and a bit reacquanting ourselves with the Zek'voz, this time in his mythic and final form. In this version of the fight, the Nerubian Voidweaver adds can additional bit of awfulness, requiring coordination of stuns and CCs. Additionally, the rings of Surging Darkness pulse 4 times in total, with fun yet frustrating patterns to avoid. Good work, everyone. The Vortex Extermination Service moves onward to handle a leech next!